The What Am I? quiz from last week was a tricky one and it went unsolved for the entire week...so it is time to give you guys another whack at it. Here is another view of the same vehicle. What Am I? Ok.. 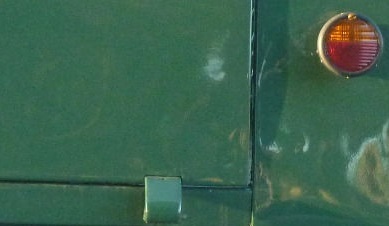 So this green paneled vehicle goes with the what appeared to be "blue" panel from last week. I'm thinking its some kind of late '30's park/airport limo (oh wait, some started calling them station wagons) or touring bus. So whAt was last weeks answer?